NeoTork’s performance and unique concept has generated a lot of curiosity, not just about our tool design, but also about its applications and operating procedures. Below are the answers to some of the most common questions we’ve been asked. How reliable are the steel cables ? Steel cables are not often found in downhole equipment but they are very common in all other industries, including oil and gas. In fact, the whole drill string is suspended over the drilling floor by a cable ! The steel cables in NeoTork are only used to transmit torque, they are not affected by excessive axial loads (WOB or pulling on the tool). Those forces are borne by purposely-designed steel shoulders that also limit the tool stroke amplitude. For reference, steel cables and their corresponding couplings are load tested in our warehouse before assembly. What happens if the cables break ? As long as the tool is used within its operating limits, the cables will not break. However, if they were to break, the tool would no longer transmit torque and the rotating shaft would act like a swivel. NeoTork would have to be pulled out of the hole, but it would retain its full pulling capacity. Steel wire cable breakage does not cause the loss in hole of any component or weaken the tool’s pulling capacity. Why are the cables set at an angle ? Cables are set at a given angle. This angle ensures that the bottom shaft will not rotate until the predetermined torque threshold has been reached. If the cables were set straight, any torque fluctuation would immediately activate them. The shoulders of the sleeve and the tool shaft prevent further rotation. How are the cables kept at a set angle ? The shoulder, which supports the weight hanging below the tool, also stops the extension of the tool beyond a certain length, this is what sets the cables at the given angle. It is this shoulder, not the cables, that supports downward loads when the system is pulled out of the hole. It is the same shoulder that bears any impact from upward jarring. How are the cables all set to the same tension ? For NeoTork to work effectively, each cable needs to be set to an equal tension. During tool assembly, the cables are first fitted to the upper part of the tool. They are then attached to a specialized apparatus to apply exactly the same tension to all cables. Once the right tension has been obtained, bolts and counter bolts are tightened to the bottom part of the tool as well as being secured with Loctite. All cables are now set with the exact same length and tension and any load will be shared evenly. How fast does the tool react to torque peak ? The tool reacts immediately and automatically – it shortens - to any torque peak exceeding the preset threshold. The tool will progressively return to its full length when the drilling torque reduces as the bit drills off. The system is almost friction-less. The cables basically have no resistance to their rotation around the shaft. All the torque sustained by the bottom shaft is utilized to compress the disc springs through the shaft rotation. How fast does the tool return to its original fully extended position ? This depends only on how long the bit takes to drill off. As soon as the load on the disc springs decreases, they extend and push the bottom assembly downwards, returning the tool to its original length. The tool does not encounter any friction when it extends, as the system is virtually friction-less. Can NeoTork make the bit rotate backwards ? No. A full extension of the tool, starting from a full contraction, corresponds to a 90° anti-clockwise rotation, which is very little when compared to the RPM levels applied to the whole drill string. A good way to think about it is to imagine running inside a high-speed train in the opposite direction of travel. No matter how fast you run, you will always be moving in the same direction as the train. Can the bit be lifted off bottom ? No. The energy required to contract the tool and effectively lift the bit, comes from the bit itself, in the form of drilling reactive torque. As soon as torque reaches the level of resistance forced by the disc springs, NeoTork will stop contracting. As a result, the bit always remains engaged, effectively drilling at an appropriate torque level. Yes. When the tool receives a downward impact, it will close until the bottom sleeve meets with the shaft shoulder. In the opposite direction, if the tool receives an upward force, it is the upper shoulder that limits the tool extension, and take the force of the impact. The tool has been extensively tested and designed to cope with peak energy and the high levels of impact that are common during jarring. As a precaution though, we recommend that once a tool has been jarred, it is sent back to the warehouse for inspection. Where should the tool be positioned in the BHA ? This depends on a combination of factors including hole profile, BHA composition, planned drilling parameters, etc. NeoTork tools are preset in the workshop for a range of parameters (WOB, torque). We recommend placing the tool between 60 to 120 feet above the drill bit, depending on the configuration of the BHA. NeoTork can also be positioned immediately above the drill bit. However in this case the WOB range needs to be well defined; if WOB is heavier than calculated, a portion of the tool stroke will be absorbed by the spring discs’ compression. How will the driller know that the tool is working ? Although the function of NeoTork is to ‘store’ excess torque, any increase in downhole reactive torque remains visible on surface. Drillers will only need to monitor surface gauges, particularly torque and/or pump pressure (for PDM) as the indicators for slacking more weight on the bit. Whenever torque increases above expected level, drillers will need to hold on WOB (or slacking coil in case of coil tubing drilling). As torque drops to within the normal range, the driller can raise the break. Ultimately it is the improvements in drilling performance and reductions in equipment damage that will be the best evidence of NeoTork working effectively. Should Neotork replace roller reamers ? No. NeoTork is designed to manage torque variances originating from the drill bit/formation interaction. 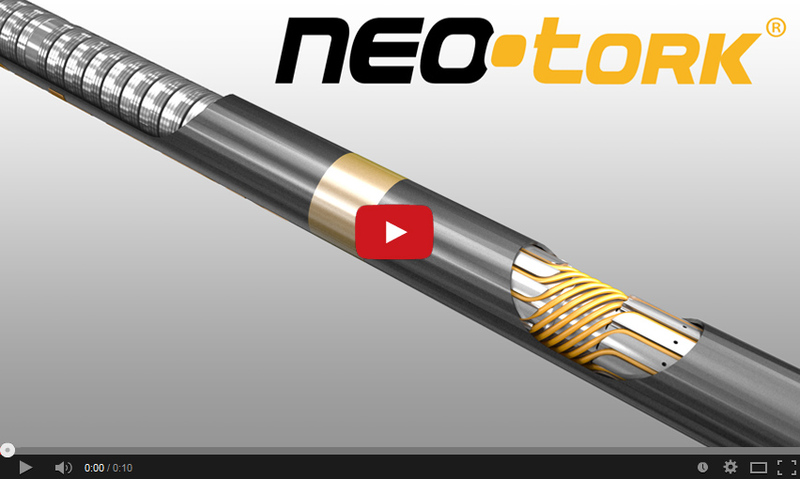 NeoTork is not intended to address bore-hole issues and as such is not a substitute to roller reamers. Quite the opposite, the combination of NeoTork and roller reamers in the same BHA secures the optimum torque mitigating package that addresses both borehole and bit face reactive torque. Is NeoTork’s stroke big enough ? Yes. When NeoTork contracts, it reduces the depth of cut of the PDC cutters in the formation or the material being drilled. This contraction is limited to millimeters and cannot exceed the maximum depth of cut as the bit always remains engaged. As a comparison, NeoTork’s shortest stroke on the 2 7/8 tool is 50 mm while the diameter of the biggest PDC cutter is 19mm ! How many tools should I order for a single drilling section ? This will depend on the number of drill bit runs. All our tools are provided with back-up. Generally our tools are set for what would be normal drilling parameters. If there are intermediary operations, such as coring or hole-opening that require less WOB, we suggest ordering an additional set of tools preset for those parameters. Can I pump LCM through the tool ? Yes. LCM can be pumped through NeoTork without needing to pull it out to surface. We do however recommend sending tools for service that have been in a well in which acid/cement has been run or in which high LCM concentration has been used. Won’t the tool shorten during back reaming a tight spot ? For NeoTork to react, it needs to receive a torque load in excess of the equivalent pre-set WOB + the weight of the BHA located below the tool. Remember, the tool is always stretched to its maximum length by the action of the disc springs (Belleville springs). For the tool to shorten those springs have to contract by the swiveling of the bottom shaft. This contraction can’t happen until a force larger than the set WOB is generated. When the BHA is off bottom this value is further increased by the weight of the BHA located below NeoTork. In other words if NeoTork is set to trigger at 10 tons and there is a BHA weighing 2 tons below it, you would need to back-ream with over 12 tons of pull before NeoTork would react and pull up the BHA underneath. The chances of this happening are very small and easily avoidable.